Welcome to the new Got To Do app blog, I intend to make all announcements available on here, updates to user guides and release notes are all coming! Just got my HTC Incredible. I am a heavy Toodledo user. Your App looks great in the couple minutes I played with it. Are Tags supported for filtering? Not currently as Toodledo API does not support tags in the same way it does contexts/folders. I have future plans to provide local support for tags. I know ToodleDo doesn’t really support it; but rich text (HTML) formatting for notes would be fabulous! Short of that, just an auto-numbering/auto-indenting outline capability would be great! I love GTD. And I subscribed to this forum to receive updates and tips on the product (I’m assuming this is the GTD Yahoo Group). However, I’m getting every post from all of the subscribers; and I can’t see how to unsubscribe or filter out the user posts. I’d like to continue getting all of the GTD announcements, just not the users’ input. I apologize if I’m missing something obvious. How do I change or take a task off of hot list. How does one use “context” and folders? Is there a more in depth tutorial? I think this is a very interesting “to do” app. Willing to upgrade and recommend. 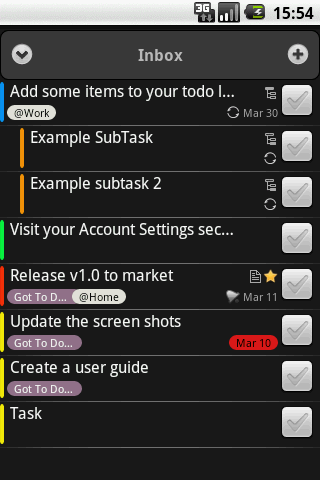 I’m using gottoapp but have an issue with displaying subtask. Thay are not displayed in the today/tomorow place despite thay have to be done in the next day. Are you inform about it? Is there a way to go around this issue ?